If that isn't the most boring image ever posted to this site, I'd be astounded. Well, folks, Election Day is finally upon us here in the United States. I could think of no better way to celebrate (other than by voting which, if you have yet to do, stop reading this right now and go do so) than by playing a retro game about campaigning for the presidency. Luckily, I have just the very thing in Campaign '84 for the ColecoVision. It's a fairly obscure title, so I'll not be offended if you haven't heard of it. My father and I used to play it fairly often and I would always choose to be the Republican. I'm sure it stung a little bit for him to have to control a donkey avatar in the game, but equally certain that was compensated for by the swell of pride in his son's chosen political affiliation. Follow with me after the jump as I examine one of the more off-kilter games released for ColecoVision. 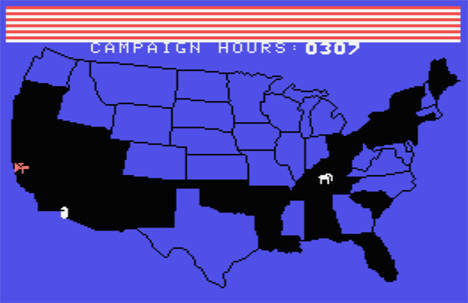 Campaign '84 is about as close as you could get to an election simulation game in 1983. The object, of course, is to take your candidate to the highest office in the land by campaigning through out the US, becoming popular with voters and earning the precious 270 electoral votes necessary to win. The graphics are laughable, even by Coleco standards, and the gameplay seems like it would be about as fast-paced as watching a prostitute decompose. There's more going on here than meets the eye, I assure you. Before the game begins, the players must determine where they stand on the difficult issues facing the nation. Are you going to be for or against making the oyster the national food? Where do you stand on the hot-button topic of pet rock unemployment. The issues themselves are random and irrelevant, but it's a cute addition. What's really important here are the numbers of the issues, but I'll get back to that in a second. Once you have established your platform, the race is on. Presented with a map of the contiguous 48 states (just as in real life, Alaska and Hawaii aren't important to politicians), you move your elephant or donkey icon around the borders of the states. To begin campaigning in a state, you must find its entry point by traveling its border with a button held down. Being in a state changes the screen to a flag of the United States, made up of people. Your task now is to mercilessly trample them and, thus, gain their support. Every person you trod upon will add to your popularity meter (the corrolation to actual politics astounds). As you step on them, they disappear, slowly eliminating the area in which you can march about. Once you reach a point where you can no longer step on another person, your campaign in that state is complete. As you rampage through the populous, numbers will appear and move over the surface of the flag. 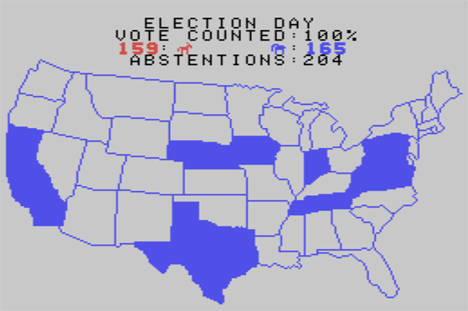 These numbers represent the "yay" or "nay"stances ("nay" has its number inside a white box) on the issues from the beginning of the game. Collecting numbers that match what you selected will give you a massive boost to your popularity, while grabbing those which do not will hurt your reputation. Do you see it? It's just like real campaigning! All you have to do in order to win the love of the people is stick to your popularist stance on completely pointless crap and they'll adore you! You can only visit each state once. After you have done so, the state turns black on the map to indicate that you've been there. In addition, you are no longer restricted to moving around the borders of the state, instead being able to pass right through which makes it easier to cross the country. As in all campaigns, you have a limited amount of resources to work with. This is represented by a timer that counts down throughout the course of the game, whether you're traveling the country on the main map or campaigning in a state. You can add more time by grabbing donations, represented on the map by what I can only assume is a white plate (fundraising dinners, perhaps). Grabbing one will stop the game for a moment and bring up a message explaining where your money came from. Of course, no campaign would be complete without shocking scandal. The other icon moving across the map is an orange bullhorn. Should you run into one of these, you'll lose a bit of time as your campaign is forced to spin some spurious attack on your character. Examples include your family not recognizing your name or your son campaigning for your opponent. Again, this is a great example of how actual political campaigns work. Oh, sure, everything is well and good when an oil tycoon dumps a million dollars into your coffers. God forbid, however, that you wear mismatched socks! That would obviously make you unfit for the highest office in the land. When you have either campaigned in every state or time runs out, the votes begin to be counted. Similar to election coverage on national television, the votes slowly begin to pour in and states are called, one by one, for the two parties. If a state was not campaigned in at all, it abstains from the vote. States have the same number of electoral votes as they did in 1984, so there's some strategy involved in making sure you campaign in the right places to ensure you reach the necessary 270 votes to win. Campaign '84 can be played alone, but there really is no point to it. In a two-player game, players take turns campaigning in states. Unlike some states in the real USA, electoral votes for each state all go to the candidate who earned the highest popularity when campaigning there. Even with a second player, however, the game itself is not actually fun. It's the same, simple, boring thing with every state. The concepts are pretty clever and a case could be made for it being educational in the sense of teaching people about the electoral college, but the gameplay is so monotonous that it's hard to even complete a single play-through. This is a novelty game, pure and simple, but one which could actually wind up being pretty good if re-made. 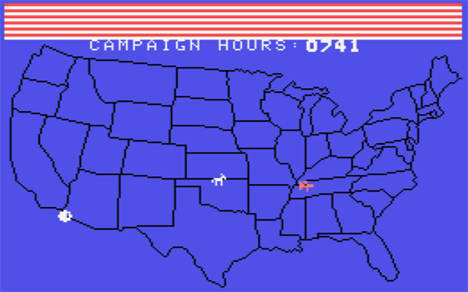 Change up the way you campaign in states with some mini-games (perhaps a Qix clone for one state, an Arkanoid one for another) and there really might be something there. Alas, it's probably just a fantasy on my part.